(CNN) -- Usain Bolt, who was involved in a high speed car smash in his native Jamaica last month, will be fit to run in a special street race in Manchester this weekend. 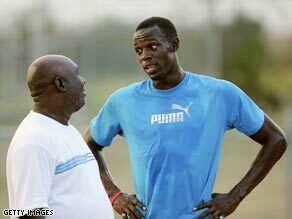 Glen Mills (left) has guided Bolt to the very top of world athletics. Bolt had surgery to remove thorns from his left foot after crashing his BMW sports car on April 29 and missed an international meeting in Kingston the following weekend. There had been doubt that the world's fastest man would be able to take part in a special 150 meter race in the city center of the north-west of England city on Sunday. But his coach Glen Mills told the official Web site of the world governing body of athletics that the Beijing triple gold medallist would now run. The IAAF had reported last week that Bolt had suffered "slight discomfort" when he returned to training last week, wearing just trainers. Mills said that he had now run in spikes for the first time and "looks OK and will be fine for Manchester." The innovative 150m race, which will take place on a specially-constructed track, will see him race against top British sprinters Marlon Devonish and Simeon Williamson. Bolt, an avid Manchester United fan, will also meet his heroes at their training ground and has promised to give Cristiano Ronaldo a sprinting lesson in return for a signed shirt. He will also be the guest on honor at their Saturday clash with Arsenal at Old Trafford when the Red Devils could clinch the Premier League title. Bolt became a global superstar when he won he completed the 100-200m sprint double in Beijing, both in world records, before helping Jamaica to gold in the 4x100m relay. The 22-year-old will be bidding to repeat the heroics at this year's world championships in Berlin in August.